Nearly 50 people enjoyed our annual ‘Catching up with Catch Up®’ conference, Wales, held in the historic committee rooms of Glamorgan Building, University of Cardiff. As always, there was a lot of catching up to do, but Graham Sigley, Deputy Director of Catch Up®, ensured that everything ran like clockwork! Sioned Bowen, Catch Up® Trustee, welcomed everyone and made sure that we could all operate the headphones given to us by the translator! We were delighted to welcome back Claire Rowlands, Deputy Director of the Curriculum Division of the Welsh Government, who got the conference underway with a keynote speech that looked at the current context in Wales, and outlined ‘where it was going’ following the “eagerly-anticipated” Donaldson review. Claire said that schools were “still working very hard” with the Literacy and Numeracy Framework (LNF) and that Estyn had recognised progress in their annual report. Claire gave us a taster of the “very exciting report” due out in November, containing 68 recommendations that have been taken on board. She explained that there will be three cross-curricula areas of responsibility which ‘free up the curriculum’, getting back to the purposes of education, whilst recognising key strengths in the current curriculum. Claire then presented certificates to three schools who have recently achieved a Catch Up® Excellence Award. The case studies presented by schools who have taken part in the Catch Up® Excellence Awards are always a popular feature at the ‘Catching up with Catch Up®’ conference, and this year was no exception! 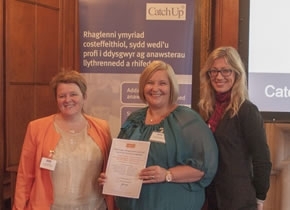 Silver Award winners Ysgol Emrys ap Iwan were represented by Anne Hickey, who told us about the excellent work they are doing with both Catch Up® Literacy and Catch Up® Numeracy. Anne shared with us some of the challenges faced when working with secondary-aged learners, and how they had overcome those challenges to fully engage their learners. We then had an update from Siwan Meirion (GwE, North Wales Consortium) regarding their embedding of Catch Up® in their strategic plans. Siwan outlined the impressive systems that are in place to ensure that a cycle of Catch Up® training, Catch Up® delivery and Catch Up® monitoring (in English and Welsh) are fully integrated into the consortium plans. Siwan spoke about the “clear advantages” of this approach, and some of the new developments made to strengthen the approach. Siwan then outlined their plans for some exciting ‘next steps’, whilst acknowledging that some challenges still remained! Debbie Rowan, SENCo and Catch Up® Accredited Trainer, spoke to us about her work establishing some of the new Regional Training Centres across the UK for Catch Up® and then, in particular, her work within the centre in South Wales. Designed to complement the consortia approach to working, Debbie gave us an overview of its success to date, and also outlined some plans for ‘additional supportive opportunities’. Graham then gave us a brief update regarding the Catch Up® Action Plan, along with some ‘hot off the press’ news regarding the new website and database! The conference ended with Graham giving our congratulations – once again – to Alan Evans, on being awarded the OBE for his services to Education. The conference presentation is available to download from our conferences page.